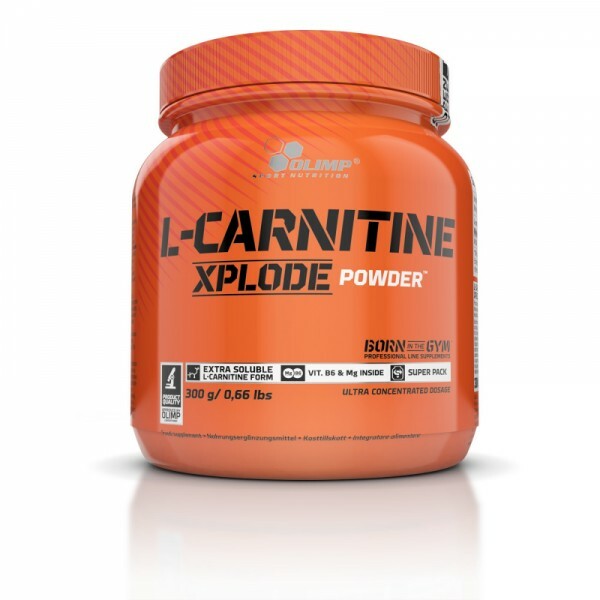 Produktinformationen "Olimp L-Carnitine Xplode Powder 300g"
Today we give you the newest product from the Series – L-CARNITINE XPLODE POWDER! A MEGA-DOSE of 1500 mg L-CARNITINE IN EVERY 3 g! L-Carnitine is a key element of the last stage of the process of the decomposition of fats. It transports free fatty acids to where they are finally oxidised (mitochondria) and where the energy accumulated in them is freed – it substantially increases the body’s exercise capacity. The effective oxidation of free fatty acids guarantees that they will not be re-stored as triglycerides, therefore increasing the volume of adipose tissue. the correct functioning of the muscles, nervous system, maintaining correct psychological functions, diminishing feelings of tiredness and fatigue, maintaining healthy teeth and bones, and maintaining electrolyte balance. It is also involved in correct energy metabolism and helps in the correct synthesis of proteins. The vitamin B6 contained in L-CARNITINE XPLODE POWDER, is also important, as it composes many enzymes taking part in metabolic conversions as well as directly participates in the metabolism of carbohydrates (the creation and decomposition of muscle glycogen) and fats, additionally increasing the production of energy. Vitamin B6 is indispensable for the production of haemoglobin and, by participating in the creation of antibodies it increases the immunity of a body. What are the advantages of L-CARNITINE XPLODE POWDER? - perfect as an addition to amino acids or isotonic before or during training. The preparation is designed for people looking for their fatty tissue loss who are typically working in white-collar jobs and exercising regularly. It is also recommended for people on a vegetarian diet, as an L-Carnitine supplement. It is designed, in particular, for people who do not want to or cannot take large amounts of capsules or pills. An adult person’s body contains approximately 20 g of L-Carnitine (Brass, 2000), 98 percent of which is stored in the muscles (Rebouche et al., 1986). It is very important for correct development that the muscles are appropriately saturated with L-Carnitine. L-Carnitine transports fatty acids and introduces them to the burning processes occurring in mitochondria – this makes it possible for fatty acids to be transported through the internal mitochondrial membrane to the matrix of the energy centre of a cell, where compounds are decomposed. Therefore, L-Carnitine is a compound which is indispensable for the oxidation of fatty acids! 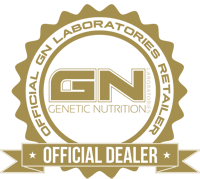 Numerous scientific publications focus on researching the impact of supplementation with L-Carnitine on the body’s tissue composition. 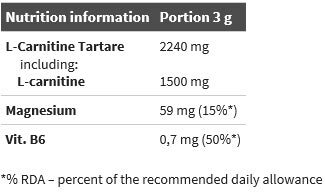 In 2013, Stephens administered twice a day – 80 g of carbohydrates or 80 g of carbohydrates and 2 g of L-Carnitine Tartare to people taking part in sports recreationally. After the end of the 12-week-long experiment, the subjects from the “carbohydrates” group had gained on average 1.8 kg of fat and, at the same time, lost 200 g of the fat-free body mass, mainly consisting of muscle tissue. While in the group supplemented additionally with L-Carnitine the fat mass had not changed, but the muscle tissue increased, on average, by 400 g! - supporting the functioning of the nervous system. - maintaining the electrolyte balance. Rebouche CJ, Paulson DJ. Carnitine metabolism and function in humans. Ann Rev Nutr 1986; 6:41–66. 74,7% L-Carnitine L-Tartare, aromas, maltodextrin, colouring – E 150d (for all cola flavours); magnesium oxide, anti-caking agent – silicon dioxide; sweeteners – acesulfame K, sucralose; acidity regulator – citric acid; colourings: carotenes (A), carmine (B), riboflavin (C), E 150c (D), E 150d (E), E 133 (F), patent blue V (G), indigo carmine (H), chlorophylls and chlorophyllins (I), turmeric (J), anthocyanins (K), paprika extract (L), betanin (M), vegetable carbon (N); 0.03% pyridoxine hydrochloride – vit. B6. (A)-(Z) – Depending on the flavour of the product, the symbol (A-Z) of the ingredient used is provided besides the expiry date. 1 dose per day before a training session. Dissolve 1 dose (3 g = 1 measure) in 130 ml of water. Consume immediately after preparation. Do not exceed the recommended daily allowance. Food supplements should not be used as substitutes for a varied and balanced diet. A balanced diet and healthy lifestyle are recommended. Keep out of reach of small children. Note: Potential precipitation may occur but does not affect the quality of the product. Not recommended for pregnant or breast-feeding women. Weiterführende Links zu "Olimp L-Carnitine Xplode Powder 300g"
Kundenbewertungen für "Olimp L-Carnitine Xplode Powder 300g"